Most of the hill sheep in Tarset are of the horned variety. 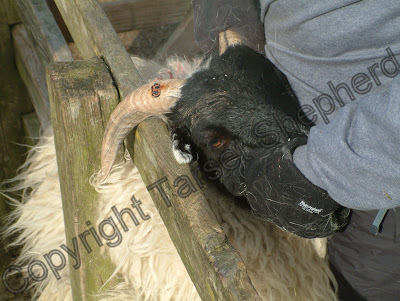 Both breeds of Black faced and Swaledale sheep grow horns. When born the sheep have small horn buds on their heads, on the female (ewe lambs) these buds are hardly visible whereas the tup (male) lambs have quite strong and noticeable horn buds. As the sheep mature the horns grow. Once deemed strong enough hot irons are applied to the sheeps horn, one horn carries a number showing the age of the sheep and the opposite horn (occasionally the same horn) carries some sort of lettering. 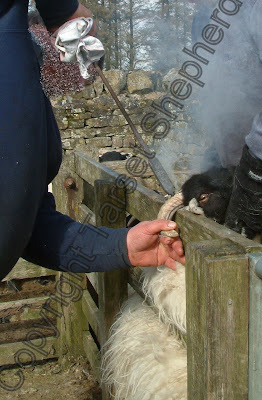 The ewe hoggs(older lambs) are horn burnt once their horns have shot (grown) sufficiently, although there are a few farmers who prefer to wait until they are gimmers (year old), being slightly older the horn has basically matured and is stronger. By burning the horns there is a permanent mark on the sheep. Any lettering put onto a horn will be to show who the owner of the sheep is. This can vary, there may be initials to name the owner of the sheep and the farm they belong, for example Farmer Smith of Farmstead may well burn SF onto his sheeps horns. Some may just put the farmers initial on or even the farm name. NE in Tarset stands for Northumberland Estates burnt onto sheep belonging to the Duke of Northumberland. A hot iron will burn a few horns before it needs to be placed back in the fire, there are usually two of each (numbers and letters) in the fire at once ensuring you don't have to wait for them to re heat. 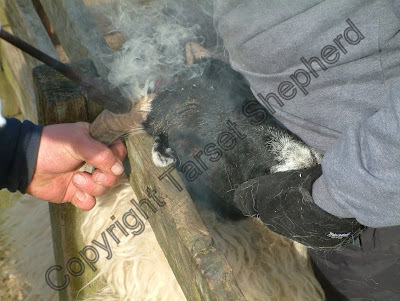 Burning is not painful to the sheep, it is along similar lines to hot shoeing horses and is most probably more uncomfortable for the person holding the sheep who either has to hold their breath or in hale the smoke. 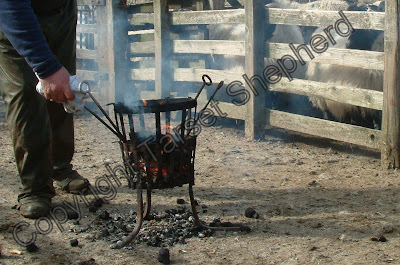 Care has to be taken by the person using the iron that it doesn't slip off the horn and burn the person holding the sheep. I've only once been burnt by an iron and that was when I decided to teach a farmers son how to do the job, I carried the number six around on my hand for quite a while! I always used to burn the numbers in an opposite fashion. The number put onto the horn would correspond with the year they were due to bwe drafted out of the flock. This hogg, born in 2005 would have had a number one burnt onto the horn which would have meant she would be six year old and drafted out of the flock in 2011. Everyone has different methods. Once burnt the hoggs are ready to be returned to the hill. Back out to their mothers. Giving the fields they've been wintering in a chance to freshen up before the ewes are brought in to lamb. This also gives the hoggs a chance to settle on the hill with the main flock, for them to remember where they are meant to live before the ewes leave them to come into the fields to be lambed. Can this also be done to goats? I can't see why not Justin, the horn is the same on both species. There is probably someone somewhere who is already practicing some sort of hornburning on goats.